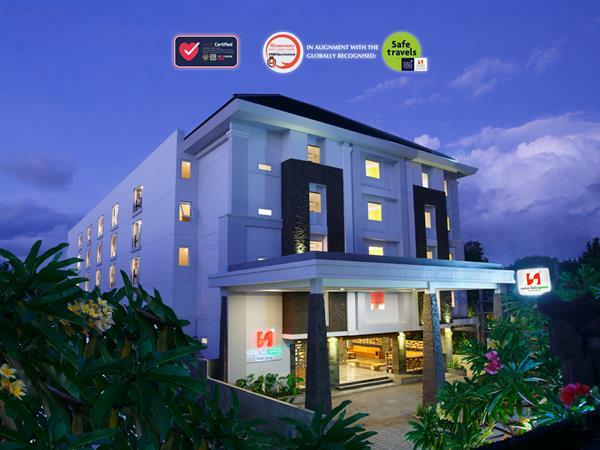 Swiss-Belexpress Kuta, is a contemporary budget hotel located in the heart of Kuta. The hotel is the first property under the Swiss-Belexpress brand. This two-star budget hotel offers visitors a comfortable yet affordable escape in the heart of Kuta’s entertainment district. The hotel itself showcases a mixture of Balinese architecture with natural stone on the exterior and natural color wood used on walls and furniture, giving it an industrial-look design all over the hotel. Boasting a spacious lobby considering it’s a budget hotel, there will never be an issue at Check-In with large groups or numerous arrivals at the same time. Guests can choose from three room categories including the Express Room, Express Super and Express Triple to accommodate groups of students, friends or small families. Connecting room’s keep the party going while some specially designed rooms have been built for easy accessibility for those with physical limitations. Today’s tech-savvy travelers will also appreciate the property’s central location and fresh design, as well as smart TVs and free Wi-Fi access allowing them to be fully connected throughout their island holiday. An industrial design style of Lounge, Restaurant and Bar is available on the ground floor for daily breakfast and snacks during the day. You can also relax at the pool deck area. The hotel features an array of facilities including a swimming pool, free wifi and parking. Located in the heart of Kuta, Swiss-Belexpress Kuta is the place to stay! Visit Sky Garden which has a reputation for holding the best parties in Bali with the world’s best DJs.